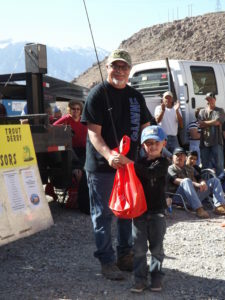 The 2019 Blake Jones Trout Derby is set for Saturday, March 16th in Bishop, California. Since 1968, the event has been a favorite tradition for Eastern Sierra locals and visitors alike. This year is shaping up to be a great one according to the Bishop Area Chamber of Commerce & Visitors Bureau. Every year, nearly $10,000 worth of cash and prizes are awarded including float tubes, rods & reels, gift certificates to local shops and restaurants and more. The Blake Jones derby is a blind bogey format with categories for adults and kids of all ages. In addition to the blind bogey awards, there will be prizes for early bird registrations, farthest travel, biggest fish, even prizes for those who don’t catch any fish or choose to catch & release. There will also be a special drawing for a brand new Dave Scadden float tube and themed basket raffles. Registration, weigh-in, and awards ceremony will be at the Eastern Sierra Tri-County Fairgrounds in downtown Bishop. Fishing locations include Pleasant Valley Reservoir and the Owens River. California Department of Fish and Wildlife plants Rainbow Trout year-round in these locations and the Bishop Chamber will arrange for supplemental stockings of fish purchased from Wright’s Rainbows prior to the derby. “We want to make sure there are plenty of fish for everyone,” explains April Leeson, Event Coordinator at the Bishop Chamber of Commerce. “The derby is a real family-friendly fishing fest. In addition to the fishing contest, we’ll have information booths, educational displays, kids’ casting games, activities and more,” Leeson added. Registration for the derby is now open ($20 for adults and $10 for kids under 12 years old). Sign up online at www.bishopvisitor.com or drop by the Bishop Chamber of Commerce, 690 North Main Street. 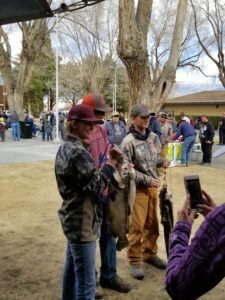 The Blake Jones Trout Derby is co-sponsored by Inyo County and the City of Bishop, plus many other generous prize sponsors. For more information, contact the Bishop Chamber at (760)873-8405.